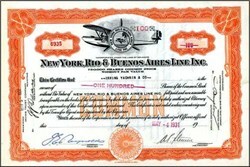 Beautifully engraved SCARCE Certificate from the New York, Rio & Buenos Aires Line (NYBRA) issued in 1931. This historic document was printed by the E.A. Wright Banknote Company and has an ornate border around it with a vignette of the company's airplane and logo. This item is hand signed by the company's Vice President, A.P. Stevens and its Treasurer, F. E. Reynolds. This early aviation certificate is over 76 years old. 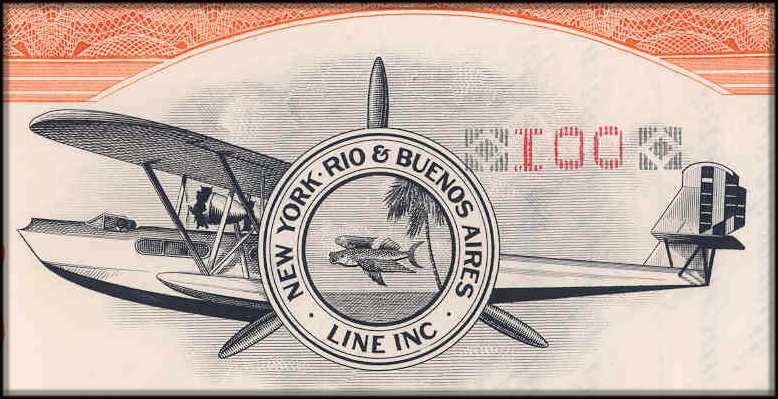 The New York, Rio, and Buenos Aires Line (NYRBA) was incorporated in March 1929 under the leadership of Ralph O'Neill. A former WWl Ace and Boeing representative in South America, O'Neill recognized the need for an airline that would deliver to the under-industrialized continent and began operations out of New York. After a flight of his floating airplane to Buenos Aires, NYRBA opened regular service on August 29 from Argentina's capital to Montevideo. Only a few days later, service from Buenos Aires to Santiago, Chile was established, marking the first transcontinental route in South America. In November, O'Neill was granted landing rights in Brazil and also added a route from Buenos Aires to Paraguay. On February 18, 1930, the Consolidated Commodore began operating for NYRBA, and in a ceremony before the plane's departure on NYRBA's new Miami-Santiago route Mrs. Herbert Hoover christened the vessel that would forever be synonymous with O'Neill's company, although Juan Trippe tried to take all the credit for the airline where he had no relationship. The rivalry between NYRBA and Pan Ammerican Airways we fierce. Just previous to NYRBA's formation, Pan American Airline's chief, Juan Trippe, had settled to split the West Coast market with his competition. An incredibly aggressive businessman and unwilling to share revenue in the East, Trippe set out to takeover O'Neill's company for pennies on the dollar. Using his political clout, Trippe manipulated politicians in Washington to make expansion and needed mail service revenues impossible for O'Neill's young company. After being denied the East Coast mail route to Buenos Aires by U.S. Post master General W.F. Brown (who took a bribe), NYRBA's financial future was dismal, especially during the midst of the depression. O'Neill was forced to sell his airline to Trippe. Ralph A. O'Neill wrote a terrific book "A Dream of Eagles - The Story of New York, Rio, & Buenos Aires Line (NYRBA)" about his experience in the airline.